After months of planning and anticipation, the ILGA (International Lesbian, Gay, Bisexual and Intersex Association) World Conference arrived in Wellington, New Zealand. GIN is happy that we had an opportunity to represent our more than 350 members at this year’s ILGA World Conference. We took along a number of our members’ and partner organisations’ information resources from various parts of the world in order to ensure maximum exposure of the work that is continuing in the area of gender, sexuality and faith. It is unfortunate that on the eve of the ILGA Conference a mass shooting took place in Christchurch. A man went on a shooting rampage at a local mosque killing 50 people. New Zealand is known for its acceptance and tolerance of all people irrespective of their religious beliefs, so New Zealanders were shocked, disbelieving and sad. This was a clear act of intentional violence. A number of the Pride events that were scheduled over this time were withdrawn to the unfortunate incident. 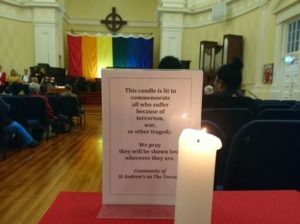 There were numerous vigils to mark this event, and many ILGA participants, including GIN attended an evening vigil in Wellington at a local cricket grounds, where Wellington Mayor, Justin Lester and a number of faith leaders joined in solidarity to show their support for the Islamic community at large and for the city of Christchurch. 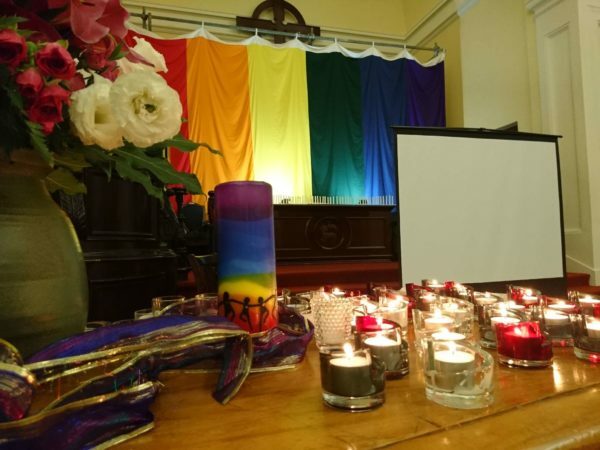 The ILGA Opening Ceremony paid respects to those whose lives were taken during the shooting, and a Māori-lead opening and elder welcome to all of us as guests in Wellington also took centre stage. On Monday evening, we were all invited to a reception dinner at the Bee Hive, which is the National Parliament House of the New Zealand. A number of our GIN members attended the event and mingled with the parliamentarians. During the week a number of politicians also shared their views on the steady progress that is been made around the world when it comes to the protection of human rights of the LGBTIQ+ community. During the week, there were sessions set aside for each ILGA region to caucus. This provided participants an opportunity to touch base with the relevant ILGA regional bodies as well as to discuss strategy for each region and its sustainability. Of course, voting for delegates to be appointed to the ILGA World Board was also high on the agenda. As the days progressed there were a number of presentations made from various parts of the world with regards to a myriad of cross-sectional items that are pertinent at this time when it comes to sustaining the momentum of the last 40 years of ILGA. It is wonderful to see how we as a community have a voice at the United Nations, at regional bodies and, through the vast ILGA membership base of 1500 organisations worldwide, reach communities on the ground where change is needed the most. Victor Madrigal-Borloz who is the UN Independent Expert on protection against violence and discrimination on the basis of sexual orientation and gender identity also spoke to the rapid and effective work that is taking place by a number of actors across the globe. A few donors also attended the conference and interacted with a number of the delegates. It was also an opportune time to touch base with donors who are interested in the work that we do. It is great to see how funders, despite the difficulties and challenges that they too may have, remain committed and excited about the future through the work that we each do. Soulforce, one of our members and partners, did a session entitled, Sabotaging Empire: The Gender Transgressor’s Guide to Christianity and Power. The session focussed on how ‘empire’ leaned on Christianity to colonise our bodies and minds with reductive and violent ideas about our bodies and desire. The session was interactive and allowed for delegates to use our own stories to identify the intersections of Christian supremacy with violence and the misuse of power. 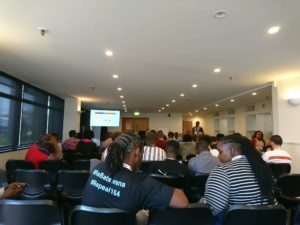 Another great session that was held with regards to families, was convened by International Family Equality Day (IFED) and the Asia Pacific Rainbow Families Forum (APRFF). GIN has partnered and continues to collaborate with IFED and APRFF as our work interlinks when it comes to reclaiming and owning the identity of our families and the diverse forms that these take. On the final day a session by Oogachaga was held specifically focused on burnout and fatigue for people who work in the human rights sector. Executive Director Yangfa Leow took us through some practical meditative and centering exercises to assist us in our busy and challenging lives. Faith Communities United in Love, based in Wellington, hosted Four Winds: an Interfaith Spiritual Gathering on the 20th of March at St Andrew’s on the Terrace. Toni Kruger-Ayebazibwe, our Executive Director, was asked to be one of the speakers at this event, where she spoke to the common threads of violence, exclusion and discrimination that tie together all forms of oppression, and invited attendees to step out of their comfort zones to recognise that all of us are expressions of the Divine in the world. Despite it being a jam packed week for us at ILGA World, we valued the connecting, the reconnecting and the exposure to the wonderful work that continues to spur on change around the globe. The conference ended on a high note with a gala dinner that was hosted along the waterfront. We look back and Celebrate the Past, in order to Liberate the Future. Here is to the next 40 years of realising acceptance, equality and respect for all through hope, love, peace and justice. 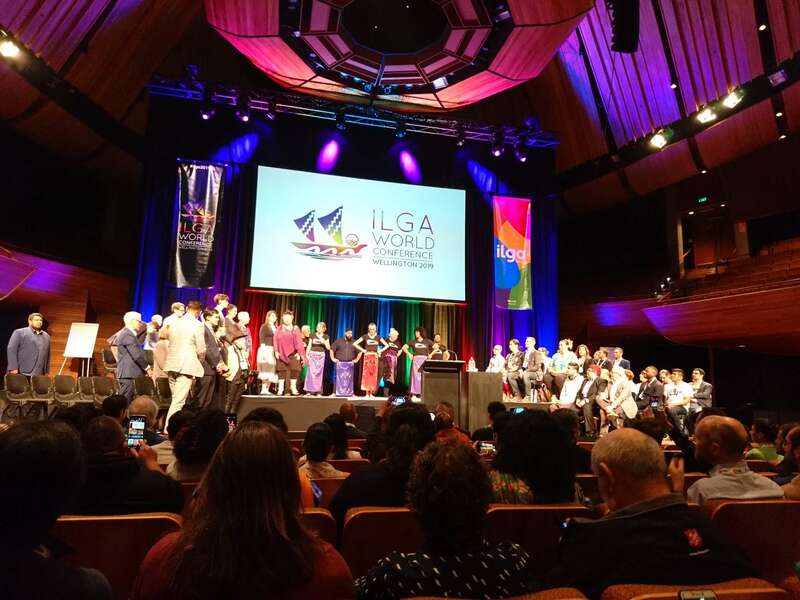 ILGA World Opening Plenary and Māori Welcome. St Andrew’s on the Terrace hosted an Interfaith and Spirituality evening known as the Four Winds. Here a candle burns in memory of the 50 lives lost in the Christchurch Mosque shootings that took place the Friday before.